So I just ordered the Boba Fett expansion off of Amazon prime for ten bucks. 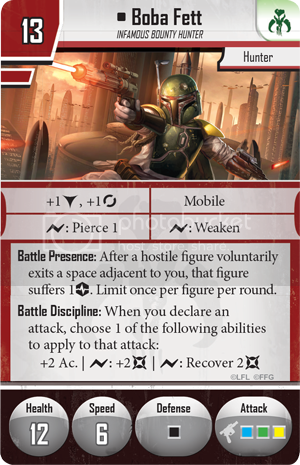 I am happy be getting him in a couple of days because of course how can a star wars miniatures game exist without Boba? I mean seriously he demonstrated in the movies that he cannot hit anyone he shoots at but looks cool so he is an auto include in everything ever correct??? The best part is in every game it seems like he is the guy that somehow is to fix a balance issue or unbalances the game. So please tell me he has no disentigration or anything of that nature. Anyone can tell me what they think about him or how best to use him? What do you think he will work well with? The first thing I tend to look at is what is my range and damage output. Add that to jump jets and you have at least one shot of a possible range 10. With diagonals as one that is a huge amount of board to cover. Granted you will have to draw that jump jets out of your deck, but for 1 point it s a game changer IMO. 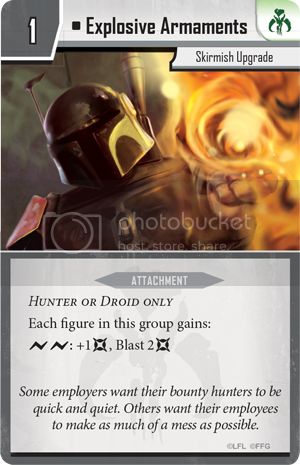 Mando Tactics could be huge game changer depending on when you pull it from the deck. It gives you +2 accuracy on both shots deals 4 additional total damage plus recovering 4 health or 1/3 of his health. Jump Jets won't really help Boba too much, since (1) he already has Mobile (ie, flight for the SWM player), and (2) it requires an Action to use and he already has Speed 6 himself (so why would he spend an Action to move just 5 instead of 6?). Jump Jets will be awesome for Vader or Chewie (big pieces with slow movement), but I really can't see a purpose for it with Boba. 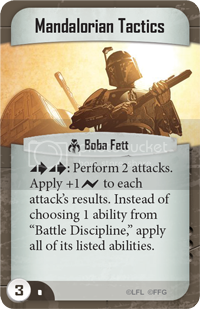 And yes, Boba with a Protector is a total beast...2 automatic Blocks (ie, damage reduction) and 1 automatic Evade (ie, surge-cancel), plus whatever he happens to roll with his Black defense die. He's pretty much equal to Vader with those defensive abilities...and he can Recover! And don't minimize the value of that automatic Evade...it makes it much harder for your opponent to get those crucial Stun or Blast or Pierce effects. I've found that he's often the last guy left on the board, just because he's so hard to get damage on. 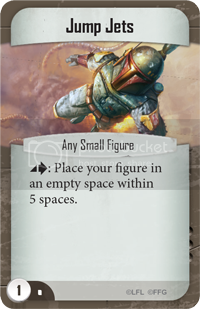 And Mandalorian Tactics...let's just say that there's a reason this bad boy costs 3pts! So I ran this last night. I thought the attachment worked differntly then it does. I thought every droid or hunter was able to get this. So that sort of screwed my squad up. But it still was able to dish out some massive damage. If my opponent wouldn't have drawn botht eh reinforcement cards from his deck to bring back Heavy Stormtroopers i would have had him. With Mando Tactics and the attachment I was able to confidently shoot from 7 away and hit both of his Royal guards and at the end put 5 damage on one and 6 on the other. Then was able to fly in a probe droid to self destruct and rolled 3 damage on it. In between He was able to heal up one the guy for two. Command cards that I would probably change is Single Purpose. Tough to use with the officers.